No doubt the most talented singer I saw today. This is not here just for the fact that it is super adorable, it would still be an article that I know a lot of people would love to see, but because the girl sings really well ! This is Kaitlyn Maher and she is singing Somewhere out there. This beautiful girl sings since her first birthday ! Exactly, she was very little! According to her parents the girl is happy to sing and spend hours doing it, which usually bring immense joy to those around you . 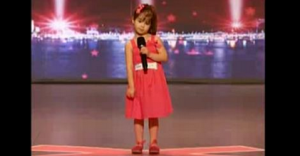 Watch the video and also let yourself go somewhere out there by the magic of this little girl voice! Super cute , totally adorable ! I have no doubt that deserves a “LIKE” ! We're offering up to 100€ in free bets. Click here to find out more. T&Cs apply.